Sunday, April 2nd 2017: Qatar’s Nasser Saleh Al-Attiyah and Dubai-based Sam Sunderland extended their leads in the car and motorcycle categories by claiming victories through the opening 276.59km selective section of the Abu Dhabi Desert Challenge POWERED BY NISSAN on Sunday. 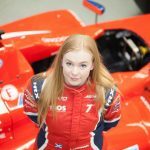 Sunderland said: “It was good to win the stage yesterday and have the choice of position, because this race is quite strategic. It was a heavy day, really tough, and we had to push a lot. To start last and finish first was not easy. The deserts are really unpredictable out there. The rain of the past weeks, I lost the front (of the bike) in the sand, in the soft dunes, braking a few times. This caused a bit of stress. But the bike is working good. I will take each day as it comes. Obviously starting first tomorrow, I will lose time. But we will see. “It was a really difficult stage,” said Quintanilla. “I came from behind with Sam. I rode really fast and I was leading for a time. But it was a good stage. It was important to come back strongly from my crash on the Dakar and get my confidence again. Kuwait’s Mohammed Jaffar and Abu Dhabi’s Mohammed Al-Balooshi reached the finish in eighth and ninth overall on their respective KTMs. Russian Vladimir Vasilyev finished third in his X-raid Mini All4 Racing, Czech Miroslav Zapletal was fourth and fellow countryman Martin Prokop produced an impressive performance in his Ford to claim the fifth fastest time. Italian Eugenio Amos was a surprise sixth in the unofficial standings. Kuwaiti Fahad Al-Musallam’s advantage in the quad section was short-lived and the Kuwaiti slipped out of the top five in the quad category behind Poland’s stage winning Kamil Wisniewski and Guatemala’s Rodolfo Schippers. Italy’s Camelia Liparoti produced a good performance to finish fourth. 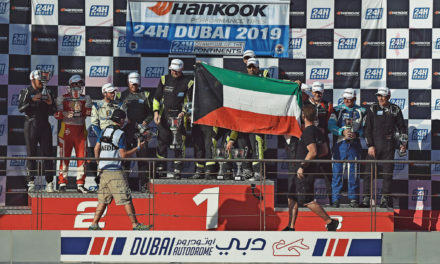 Saudi Arabia’s Yasir Saeidan has unfinished business in the T2 category after missing out on last year’s title and he made a strong start to his Abu Dhabi Desert Challenge campaign and was the front-running T2 driver at the early passage control checks. Local driver Mansoor Al-Helai’s plan to push hard in the T2 category suffered a severe setback when he ground to a halt before PC1. Meanwhile, Marat Abykayev’s challenge for T2 honours suffered a terminal blow when the Kazakh crashed his Toyota Land Cruiser heavily early in the stage and co-driver Andrey Chipenko sustained an injury. The medical helicopter was summoned and his co-driver was airlifted to Madinat Zayed hospital with a head injury. He was conscious and in a stable condition. Dubai-based Saluki Motorsport is running three different makes of car for founder Mark Powell (Buggy), UAE-based Georgy Gomshiashvili (Predator X185) and rookie Omani Abdullah Al-Zubair (Nissan Patrol). 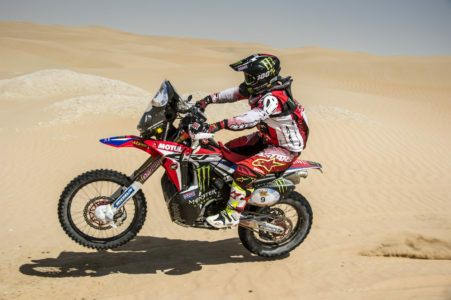 Experienced Welshman Quin Evans, Russian Nikita Abramov and former Dakar enduro rider Annie Seel, from Sweden, have been tasked with navigating duties. The trio began the day in 33rd, 30th and 25th overall. The Abu Dhabi Desert Challenge is taking place under the patronage of His Highness Sheikh Hamdan bin Zayed Al-Nahyan, the Ruler’s representative in Al-Dafra region, and has invaluable support from Al Dafrah Region Municipality, Abu Dhabi Municipality, the UAE Army, Abu Dhabi Police, National Ambulance Service, Yas Marina Circuit, ADNOC, Abu Dhabi Aviation, Al-Ain Water, Abu Dhabi Waste Management, Rotana and Centro Hotel – Yas Island, the Qasr Al-Sarab Resort and Al-Forsan Circuit. Leading quad rider Fahad Al-Musallam was given the dubious privilege of opening the road for the first of five selective sections on his Yamaha Raptor 700 R. Super special stage winner Sunderland slotted into 39th and last position, but local rider Al-Balooshi lined up in seventh. South Racing’s Jürgen Schröder headed the car contingent in his Nissan Navarra. Al-Attiyah and Al-Qassimi were sixth and seventh into the stage. Briton Alan Boyter suffered the ignominy of being the first retirement shortly after PC1. 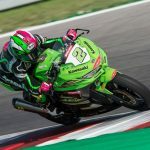 The KTN rider was not seriously hurt in a fall, but took the sensible decision not to carry on. 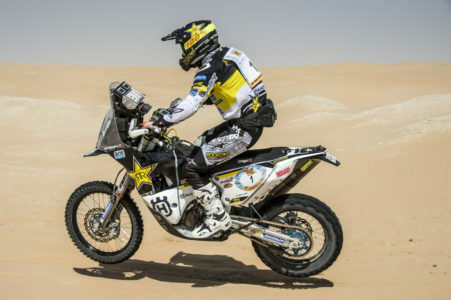 Kazakh Kirill Solokha stopped with mechanical issues on his quad, as Quintanilla headed Sunderland, Walkner and Gonçalves at the second passage control. Emirati Khalid Al-Falaisi dropped a lot of time before PC1 with mechanical issues with his Honda. Predictably, perhaps, Al-Attiyah was the quickest of the drivers to PC1 and headed Al-Qassimi’s new Peugeot 3008DKR by a virtual 4min 31sec. 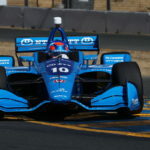 He extended that advantage to over six and a half minutes at the second checkpoint and reached the finish in a time of 3hr 14min 17sec to take a lead of 11min 35.1sec into the overnight halt. The motorcycle tussle was far closer. 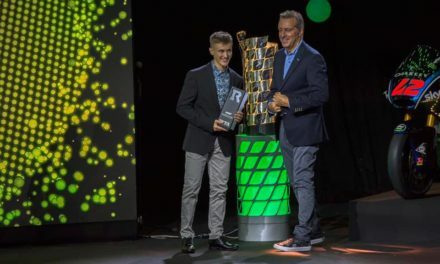 Sunderland held a virtual three-second advantage over Quintanilla at PC3 and went on to win the stage by three seconds to hold a lead of 5.7 seconds at the end of the day. Tomorrow (Monday), competitors enter the feared dunes of the Rub Al-Khali for the first time. The stage starts on the road from Mezaira’a to Madinat Zayed and heads west towards two passage controls off the Ghayathi Road, before reaching PC3, near Arada, and heading to a finish near Moreeb Hill. The stage runs for 289.39km and a liaison of 99.69km guides entrants back to the bivouac. Start SS2 – 08.00hrs N23 26.626 E53 43.550 Fodder Farm – on MZ road 36km north of Liwa City. PC1 – 08.45hrs N23 22.834 E53 06.852 Underpass (N) – 53km up Ghiyathi Rd Acc. PC2 – 09.30hrs N23 13.892 E53 10.561 Bike refuel. 36km up Ghiyathi Road. PC3 – 11.05hrs N23 00.121 E53 25.368 PC at main road – Ghaiythi roundabout. Finish SS2 – 12.15hrs N22 59.895 E53 45.540 On Moreeb Road.